Categories > Vintage Nonsports Card Chat > Tips for Newbies?? Really excited to be joining this forum and a tip of the cap to Phil at Open Binders for pointing me this way! I am brand new to collecting tobacco cards and was hoping you folks on here might have some advice for me. I picked Allen & Ginter N2, N3, N5 and N15 because I liked those the best. I have a few questions about collecting in general though, so please chime in with your thoughts! 1. I ordered the first few cards to start my collection on eBay and I'm sure that's a primary collecting source for most. But are there other places worth looking? Things like flea markets and estate sales crossed my mind as places to look but are those actually likely to have much? Or are there other types of stores or locations that would be worth a look? 2. I have seen some of the cards on eBay officially graded by someone like PSA. Is that worth doing with ungraded cards in your collection? For example, if it costs $20 for PSA to grade a card, is it likely to be worth that in the value added by having the card graded? What is everyone's experience with companies like PSA? 3. Are there any sorts of modern price guides (saw the Tobacco Cards book on Amazon from '99, but I'm sure those prices are out of date) or some other method for someone who's new like myself to be able to get a handle on what a particular card might be worth? 4. Any other tips or things that you've picked up in the hobby that would be good to know? Thanks in advance to everyone for their thoughts! I'm really excited about joining the community. Welcome aboard Brad. You will learn a lot from this forum along with meeting some great people. You made some great choices on those Allen & Ginter sets you mentioned. eBay, of course, is a great source for finding the cards you are looking for. Also, collectible and trading card shows are a good source depending on where you live. I live in Southern California where there are mainly coin & stamp shows. Auction houses are also a great source. Tom, our moderator, has started doing auctions every few months. 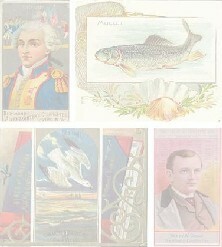 His last auction, that ended recently had some really great cards in it, including many of the Allen & Ginters. You should check it out just to see the wide variety of cards. He will post info here before the next auction. Robert Edwards Auctions, and Heritage are also good auctions for non sports cards. As for PSA, I do not highly recommend getting them graded unless they are in high grade (EX-MINT or Better), or rare. I am not a big PSA guy myself, so others might not agree. The PSA 7 and up cards are definitely great for an investment standpoint. Martin Murray has a great book out now on North American Tobacco Cards that I highly recommend if you are looking for something current. You should Google Card World (someone correct me if I am wrong) and look for the publications for sale. Anyway, I hope this helps. Feel free to ask questions freely here as this a great source for information. Thanks for the info Monty. Will definitely be on the lookout for auctions on here. As with those other online auction houses that you mentioned, I checked Robert Edwards and from what I saw on there, I only saw higher-dollar old baseball cards. Was I missing something there? I did check out Card World and that seems to be a pretty helpful resource. They also mentioned something about an LCCC catalogue that mentions including a price guide. Is that something that would be worth looking into as it appears to be updated on an annual basis? And that makes sense about the PSA comments, but as someone who's new, I'm not quite sure I would be able to tell the difference between something likely to grade out high enough to make it worth it (an 8 vs. a 6 for example). Is that just something that comes with time around the cards? I'm not quite sure I would be able to tell the difference between something likely to grade out high enough to make it worth it (an 8 vs. a 6 for example). Is that just something that comes with time around the cards? The bigger auctions like REA and Heritage offer mostly sports related items, but they occasionally have non-sports items as well. Tom B. recently had an auction devoted to NS, but that's now closed. Learning to evaluate card grades takes time and effort. PSA (http://www.psacard.com) lists the guidelines for different grades. That's something that you might want to check in on. Here on this site, you can always post a high res scan of a card to get opinions as to the card's grade. Good luck! "Be sure you are right, then go ahead." eBay is the easiest place to pick up cards, but it's also the easiest to miss the fine details on. The worst thing that ever happened to eBay was the development of the cell phone camera. Hazy, crappy, low res photos dominate most listings. I have purchased what I thought were solid EX cards only to receive them and find wrinkles, creases, trimming, and on and on. Only a tiny percentage of my collection is graded (and I am in no way wanting to start another graded vs raw thread), but one reason that I am picking up more graded cards is that when I see an EX third party graded card on eBay I have a much higher degree of certainty that the card is actually an EX grade card. I'm surprised that no one has mentioned the Wrapper magazine; it's a six week highlight for me for a lot of reasons. I watch the major auction houses and have bought from them all over time. Usually in the wee back pages there will be a few non-sport gems. Hakes, Heritage, Hunt, Huggins & Scott, Lelands, Non-Sports Auctions, REA, Goldin, Clean Sweep, Sterling, etc. etc. I would also spend some time doing research. There are some really great books out there on tobacco and gum cards (and I hear that at some point there might even be an E book (zing!). I believe that there is a lot in the current Goldin auction that has a small library of books as a single lot. It includes four copies of the ACC (the foundational research book for card collectors) and the Non-Sports Bible (which was monumental in its own right). Also, the gallery on this site is truly amazing as is the search function if you are looking for anything that was ever discussed on this site. Non-sport.com is a good resource. Lastly, don't forget the people. One of my favorite aspects of this site is that it connects me with fellow collectors and there is a ton of knowledge in the collectors who frequent this site. Hope to see and hear more from you as your collection grows! Some really good intel, thanks! Is there a good place to post those high-res scans to gather opinions, or just here in the general discussion forum? I am also surprised that I hadn't heard anything about the Wrapper, but thanks for that tip Daniel! Also thanks for that list of all of those auctions. I had only come across REA, Goldin and Heritage so far, so that gives me a lot more to chew on. Are there any types of brick-and-mortar stores or locations that would tend to have groups of cards? Like antique stores or something similar? I live in the DC area but don't know if that's worth checking on or just a waste of time and best to just stick to buying online. Would be fun to find some gems in a box somewhere though! You can register there for the next one.....currently planned for June. I had N3 and N15 complete sets in the last auction as well as some lots with singles in them. There are a LOT more auctions out there like REA, Hakes, Heritage, Sterling, Lelands, and many more that at least SOME nonsports in them. Sometimes more, sometimes less. And, as everyone has told you here, eBay is the 800 lb gorilla. Phil is a GREAT resource and someone who does a great service to the hobby by buying and breaking up sets. So when you need a card or two or ten but not fifty, he's a great resource to help get a little closer to or finish a set off. I've bought cards FROM him for a long time and sold cards TO him for mostly a similar amount of time. Great guy. Grading is a personal thing. Grading is not cheap. Grading will sometimes add value to your set or singles if they're higher grade or rare and it generally should confirm that your cards haven't been altered. Do they make mistakes? Sure. Occasionally. But generally SGC and PSA are good arbiters of a cards authenticity and condition. If you have a set of 50 VG condition N3's and add $8-$12 each for those cards, adding $400-$600 worth of cost to that set, you will probably not get that money back. If you do it to protect them and because you love the look and feel, that's a good reason. If the 50 cards all grade 7 or 8, you will likely get more than your money back from grading. Realize that, for now, grading with PSA takes a LOOOOOOONNNNNNNNGGGGGG time. SGC is much quicker but, in some cases, doesn't bring the prices that PSA does. You just have to factor that all in to the type of collecting you plan to do. Don't hesitate to ask ANY questions here. There's also TONS and TONS of threads that have been started since 2006 here that should be searchable that will help illuminate a ton of subjects and sets for you. We do only discuss cards in the main forum. If you want to BUY/Sell/Trade cards, please do so in the proper sections for what you're interested in. Probably most people on this board have looked at something that they were about to buy, thought to themselves "that's an Excellent - NM card", and paid for it and got home and eventually realized it was only VG or so. Actually, that's a good thing to have happen. It will be a better lesson in grading than anything else you can do. I'm 56 now, and I can remember items I bought 40 years ago that I paid too much for. Registered for the next auction and looking forward to it!! And thanks for the feedback on the grading, I think that will likely prove very accurate. The first few cards I bought were ungraded, now I think I'll get a few that are, and the side by side comparison will be a big help. I'm a big fan of grading, even working on sets no one has ever attempted before. I have the top PSA set of 1909-1910 T51 Murad College cards. Since I started the first set, three others have started to compete against me. I am also working on the only PSA graded T121 Sweet Caporal World War I Scenes, but nobody is going along on that ride right now. If you send in over a 100 at a time, you can get the price down to $8/card, or you can send your cards to a bulk submitter who will let you piggy-back on their bulk submission. https://www.psacard.com/psasetregistry/mysetregistry/album/187482 is my album; once you have cards graded by PSA, you can upload their photos and show people your set on the web.